Also published as "Old Garrod's Heart"
I WAS SITTING on the porch when my grandfather hobbled out and sank down on his favorite chair with the cushioned seat, and began to stuff tobacco in his old corncob-pipe. "I thought you'd be goin' to the dance," he said. "I'm waiting for Doc Blaine," I answered. "I'm going over to old man Garfield's with him." My grandfather sucked at his pipe awhile before he spoke again. "Old Jim purty bad off?" "Doc says he hasn't a chance." "Who's takin' care of him?" "Joe Braxton—­against Garfield's wishes. But somebody had to stay with him." My grandfather sucked his pipe noisily, and watched the heat lightning playing away off up in the hills; then he said: "You think old Jim's the biggest liar in this county, don't you?" 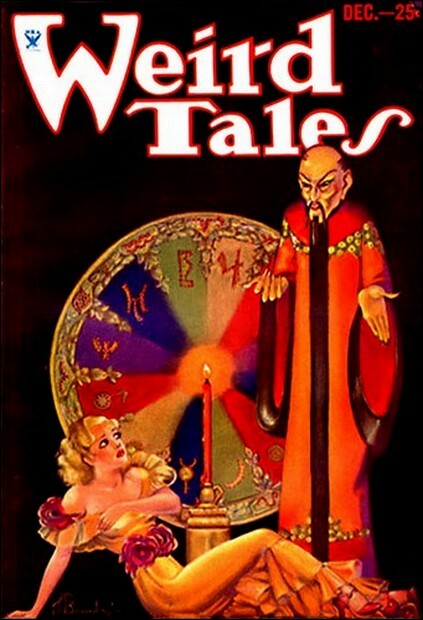 "He tells some pretty tall tales," I admitted. "Some of the things he claimed he took part in, must have happened before he was born." "I came from Tennesee to Texas in 1870," my grandfather said abruptly. "I saw this town of Lost Knob grow up from nothin'. There wasn't even a log-hut store here when I came. But old Jim Garfield was here, livin' in the same place he lives now, only then it was a log cabin. He don't look a day older now than he did the first time I saw him." "You never mentioned that before," I said in some surprise. "I knew you'd put it down to an old man's maunderin's," he answered. "Old Jim was the first white man to settle in this country. He built his cabin a good fifty miles west of the frontier. God knows how he done it, for these hills swarmed with Comanches then. "I remember him tellin' me the same tales he's told you—­how he was at the battle of San Jacinto when he was a youngster, and how he'd rode with Ewen Cameron and Jack Hayes. Only I believe him, and you don't." "That was so long ago—­" I protested. "The last Indian raid through this country was in 1874," said my grandfather, engrossed in his own reminiscences. "I was in on that fight, and so was old Jim. I saw him knock old Yellow Tail off his mustang at seven hundred yards with a buffalo rifle. "But before that I was with him in a fight up near the head of Locust Creek. A band of Comanches came down Mesquital, lootin' and burnin', rode through the hills and started back up Locust Creek, and a scout of us were hot on their heels. We ran on to them just at sundown in a mesquite flat. We killed seven of them, and the rest skinned out through the brush on foot. But three of our boys were killed, and Jim Garfield got a thrust in the breast with a lance. "It was an awful wound. He lay like a dead man, and it seemed sure nobody could live after a wound like that. But an old Indian came out of the brush, and when we aimed our guns at him, he made the peace sign and spoke to us in Spanish. I don't know why the boys didn't shoot him in his tracks, because our blood was heated with the fightin' and killin', but somethin' about him made us hold our fire. He said he wasn't a Comanche, but was an old friend of Garfield's, and wanted to help him. He asked us to carry Jim into a clump of mesquite, and leave him alone with him, and to this day I don't know why we did, but we did. It was an awful time—­the wounded moanin' and callin' for water, the starin' corpses strewn about the camp, night comin' on, and no way of knowin' that the Indians wouldn't return when dark fell. "We made camp right there, because the horses were fagged out, and we watched all night, but the Comanches didn't come back. I don't know what went on out in the mesquite where Jim Garfield's body lay, because I never saw that strange Indian again; but durin' the night I kept hearin' a weird moanin' that wasn't made by the dyin' men, and an owl hooted from midnight till dawn. "And at sunrise Jim Garfield came walkin' out of the mesquite, pale and haggard, but alive, and already the wound in his breast had closed and begun to heal. And since then he's never mentioned that wound, nor that fight, nor the strange Indian who came and went so mysteriously. And he hasn't aged a bit; he looks now just like he did then—­a man of about fifty." In the silence that followed, a car began to purr down the road, and twin shafts of light cut through the dusk. "That's Doc Blaine," I said. "When I come back I'll tell you how Garfield is." Doc Blaine was prompt with his predictions as we drove the three miles of post-oak covered hills that lay between Lost Knob and the Garfield farm. "I'll be surprised to find him alive," he said, "smashed up like he is. A man his age ought to have more sense than to try to break a young horse." "He doesn't look so old," I remarked. "I'll be fifty, my next birthday," answered Doc Blaine. "I've known him all my life, and he must have been at least fifty the first time I ever saw him. His looks are deceiving." Old Garfield's dwelling-place was reminiscent of the past. The boards of the low squat house had never known paint. Orchard fence and corrals were built of rails. Old Jim lay on his rude bed, tended crudely but efficiently by the man Doc Blaine had hired over the old man's protests. As I looked at him, I was impressed anew by his evident vitality. His frame was stooped but unwithered, his limbs rounded out with springy muscles. In his corded neck and in his face, drawn though it was with suffering, was apparent an innate virility. His eyes, though partly glazed with pain, burned with the same unquenchable element. "He's been ravin'," said Joe Braxton stolidly. "First white man in this country," muttered old Jim, becoming intelligible. "Hills no white man ever set foot in before. Gettin' too old. Have to settle down. Can't move on like I used to. Settle down here. Good country before it filled up with cow-men and squatters. Wish Ewen Cameron could see this country. The Mexicans shot him. Damn 'em!" Doc Blaine shook his head. "He's all smashed up inside. He won't live till daylight." Garfield unexpectedly lifted his head and looked at us with clear eyes. "Wrong, Doc," he wheezed, his breath whistling with pain. "I'll live. What's broken bones and twisted guts? Nothin'! It's the heart that counts. Long as the heart keeps pumpin', a man can't die. My heart's sound. Listen to it! Feel of it!" He groped painfully for Doc Blaine's wrist, dragged his hand to his bosom and held it there, staring up into the doctor's face with avid intensity. "Regular dynamo, ain't it?" he gasped. "Stronger'n a gasoline engine!" Blaine beckoned me. "Lay your hand here," he said, placing my hand on the old man's bare breast. "He does have a remarkable heart action." I noted, in the light of the coal-oil lamp, a great livid scar in the gaunt arching breast—­such a scar as might be made by a flint-headed spear. I laid my hand directly on this scar, and an exclamation escaped my lips. Under my hand old Jim Garfield's heart pulsed, but its throb was like no other heart action I have ever observed. Its power was astounding; his ribs vibrated to its steady throb. It felt more like the vibrating of a dynamo than the action of a human organ. I could feel its amazing vitality radiating from his breast, stealing up into my hand and up my arm, until my own heart seemed to speed up in response. "I can't die," old Jim gasped. "Not so long as my heart's in my breast. Only a bullet through the brain can kill me. And even then I wouldn't be rightly dead, as long as my heart beats in my breast. Yet it ain't rightly mine, either. It belongs to Ghost Man, the Lipan chief. It was the heart of a god the Lipans worshipped before the Comanches drove 'em out of their native hills. "I knew Ghost Man down on the Rio Grande, when I was with Ewen Cameron. I saved his life from the Mexicans once. He tied the string of ghost wampum between him and me—­the wampum no man but me and him can see or feel. He came when he knowed I needed him, in that fight up on the headwaters of Locust Creek, when I got this scar. "I was dead as a man can be. My heart was sliced in two, like the heart of a butchered beef steer. "All night Ghost Man did magic, callin' my ghost back from spirit-land. I remember that flight, a little. It was dark, and gray-like, and I drifted through gray mists and heard the dead wailin' past me in the mist. But Ghost Man brought me back. "He took out what was left of my mortal heart, and put the heart of the god in my bosom. But it's his, and when I'm through with it, he'll come for it. It's kept me alive and strong for the lifetime of a man. Age can't touch me. What do I care if these fools around here call me an old liar? What I know, I know. But hark'ee!" His fingers became claws, clamping fiercely on Doc Blaine's wrist. His old eyes, old yet strangely young, burned fierce as those of an eagle under his bushy brows. "If by some mischance I should die, now or later, promise me this! Cut into my bosom and take out the heart Ghost Man lent me so long ago! It's his. And as long as it beats in my body, my spirit'll be tied to that body, though my head be crushed like an egg underfoot! A livin' thing in a rottin' body! Promise!" "All right, I promise," replied Doc Blaine, to humor him, and old Jim Garfield sank back with a whistling sigh of relief. He did not die that night, nor the next, nor the next. I well remember the next day, because it was that day that I had the fight with Jack Kirby. People will take a good deal from a bully, rather than to spill blood. Because nobody had gone to the trouble of killing him, Kirby thought the whole countryside was afraid of him. He had bought a steer from my father, and when my father went to collect for it, Kirby told him that he had paid the money to me—­which was a lie. I went looking for Kirby, and came upon him in a bootleg joint, boasting of his toughness, and telling the crowd that he was going to beat me up and make me say that he had paid me the money, and that I had stuck it into my own pocket. When I heard him say that, I saw red, and ran in on him with a stockman's knife, and cut him across the face, and in the neck, side, breast and belly, and the only thing that saved his life was the fact that the crowd pulled me off. There was a preliminary hearing, and I was indicted on a charge of assault, and my trial was set for the following term of court. Kirby was as tough-fibered as a post-oak country bully ought to be, and he recovered, swearing vengeance, for he was vain of his looks, though God knows why, and I had permanently impaired them. And while Jack Kirby was recovering, old man Garfield recovered too, to the amazement of everybody, especially Doc Blaine. I well remember the night Doc Blaine took me again out to old Jim Garfield's farm. I was in Shifty Corlan's joint, trying to drink enough of the slop he called beer to get a kick out of it, when Doc Blaine came in and persuaded me to go with him. As we drove along the winding old road in Doc's car, I asked: "Why are you insistent that I go with you this particular night? This isn't a professional call, is it?" "No," he said. "You couldn't kill old Jim with a post-oak maul. He's completely recovered from injuries that ought to have killed an ox. To tell the truth, Jack Kirby is in Lost Knob, swearing he'll shoot you on sight." "Well, for God's sake!" I exclaimed angrily. "Now everybody'll think I left town because I was afraid of him. Turn around and take me back, damn it!" "Be reasonable," said Doc. "Everybody knows you're not afraid of Kirby. Nobody's afraid of him now. His bluff's broken, and that's why he's so wild against you. But you can't afford to have any more trouble with him now, and your trial only a short time off." I laughed and said: "Well, if he's looking for me hard enough, he can find me as easily at old Garfield's as in town, because Shifty Corlan heard you say where we were going. And Shifty's hated me ever since I skinned him in that horse-swap last fall. He'll tell Kirby where I went." "I never thought of that," said Doc Blaine, worried. "Hell, forget it," I advised. "Kirby hasn't got guts enough to do anything but blow." But I was mistaken. Puncture a bully's vanity and you touch his one vital spot. Old Jim had not gone to bed when we got there. He was sitting in the room opening on to his sagging porch, the room which was at once living-room and bedroom, smoking his old cob pipe and trying to read a newspaper by the light of his coal-oil lamp. All the windows and doors were wide open for the coolness, and the insects which swarmed in and fluttered around the lamp didn't seem to bother him. We sat down and discussed the weather—­which isn't so inane as one might suppose, in a country where men's livelihood depends on sun and rain, and is at the mercy of wind and drouth. The talk drifted into other kindred channels, and after some time, Doc Blaine bluntly spoke of something that hung in his mind. "Jim," he said, "that night I thought you were dying, you babbled a lot of stuff about your heart, and an Indian who lent you his. How much of that was delirium?" "None, Doc," said Garfield, pulling at his pipe. "It was gospel truth. Ghost Man, the Lipan priest of the Gods of Night, replaced my dead, torn heart with one from somethin' he worshipped. I ain't sure myself just what that somethin' is—­somethin' from away back and a long way off, he said. But bein' a god, it can do without its heart for awhile. But when I die—­if I ever get my head smashed so my consciousness is destroyed—­the heart must be given back to Ghost Man." "You mean you were in earnest about cutting out your heart?" demanded Doc Blaine. "It has to be," answered old Garfield. "A livin' thing in a dead thing is opposed to nat'er. That's what Ghost Man said." "Who the devil was Ghost Man?" "I told you. A witch-doctor of the Lipans, who dwelt in this country before the Comanches came down from the Staked Plains and drove 'em south across the Rio Grande. I was a friend to 'em. I reckon Ghost Man is the only one left alive." "I dunno," confessed old Jim. "I dunno whether he's alive or dead. I dunno whether he was alive when he came to me after the fight on Locust Creek, or even if he was alive when I knowed him in the southern country. Alive as we understand life, I mean." "What balderdash is this?" demanded Doc Blaine uneasily, and I felt a slight stirring in my hair. Outside was stillness, and the stars, and the black shadows of the post-oak woods. The lamp cast old Garfield's shadow grotesquely on the wall, so that it did not at all resemble that of a human, and his words were strange as words heard in a nightmare. "I knowed you wouldn't understand," said old Jim. "I don't understand myself, and I ain't got the words to explain them things I feel and know without understandin'. The Lipans were kin to the Apaches, and the Apaches learnt curious things from the Pueblos. Ghost Man was—that's all I can say—alive or dead, I don't know, but he was. What's more, he is." "Is it you or me that's crazy?" asked Doc Blaine. "Well," said old Jim, "I'll tell you this much—­Ghost Man knew Coronado." "Crazy as a loon!" murmured Doc Blaine. Then he lifted his head. "What's that?" "Horse turning in from the road," I said. "Sounds like it stopped." I stepped to the door, like a fool, and stood etched in the light behind me. I got a glimpse of a shadowy bulk I knew to be a man on a horse; then Doc Blaine yelled: "Look out!" and threw himself against me, knocking us both sprawling. At the same instant I heard the smashing report of a rifle, and old Garfield grunted and fell heavily. "Jack Kirby!" screamed Doc Blaine. "He's killed Jim!" I scrambled up, hearing the clatter of retreating hoofs, snatched old Jim's shotgun from the wall, rushed recklessly out on to the sagging porch and let go both barrels at the fleeing shape, dim in the starlight. The charge was too light to kill at that range, but the bird-shot stung the horse and maddened him. He swerved, crashed headlong through a rail fence and charged across the orchard, and a peach tree limb knocked his rider out of the saddle. He never moved after he hit the ground. I ran out there and looked down at him. It was Jack Kirby, right enough, and his neck was broken like a rotten branch. I let him lie, and ran back to the house. Doc Blaine had stretched old Garfield out on a bench he'd dragged in from the porch, and Doc's face was whiter than I'd ever seen it. Old Jim was a ghastly sight; he had been shot with an old-fashioned .45-70, and at that range the heavy ball had literally torn off the top of his head. His features were masked with blood and brains. He had been directly behind me, poor old devil, and he had stopped the slug meant for me. Doc Blaine was trembling, though he was anything but a stranger to such sights. "Would you pronounce him dead?" he asked. "That's for you to say." I answered. "But even a fool could tell that he's dead. "He is dead," said Doc Blaine in a strained unnatural voice. "Rigor mortis is already setting in. But feel his heart!" I did, and cried out. The flesh was already cold and clammy; but beneath it that mysterious heart still hammered steadily away, like a dynamo in a deserted house. No blood coursed through those veins; yet the heart pounded, pounded, pounded, like the pulse of Eternity. "A living thing in a dead thing," whispered Doc Blaine, cold sweat on his face. "This is opposed to nature. I am going to keep the promise I made him. I'll assume full responsibility. This is too monstrous to ignore." Our implements were a butcher-knife and a hack-saw. Outside only the still stars looked down on the black post-oak shadows and the dead man that lay in the orchard. Inside, the old lamp flickered, making strange shadows move and shiver and cringe in the corners, and glistened on the blood on the floor, and the red-dabbled figure on the bench. The only sound inside was the crunch of the saw-edge in bone; outside an owl began to hoot weirdly. Doc Blaine thrust a red-stained hand into the aperture he had made, and drew out a red, pulsing object that caught the lamplight. With a choked cry he recoiled, and the thing slipped from his fingers and fell on the table. And I too cried out involuntarily. For it did not fall with a soft meaty thud, as a piece of flesh should fall. It thumped hard on the table. 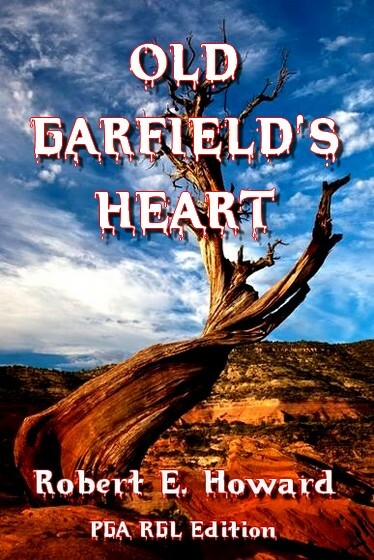 Impelled by an irresistible urge, I bent and gingerly picked up old Garfield's heart. The feel of it was brittle, unyielding, like steel or stone, but smoother than either. In size and shape it was the duplicate of a human heart, but it was slick and smooth, and its crimson surface reflected the lamplight like a jewel more lambent than any ruby; and in my hand it still throbbed mightily, sending vibratory radiations of energy up my arm until my own heart seemed swelling and bursting in response. It was cosmic power, beyond my comprehension, concentrated into the likeness of a human heart. The thought came to me that here was a dynamo of life, the nearest approach to immortality that is possible for the destructible human body, the materialization of a cosmic secret more wonderful than the fabulous fountain sought for by Ponce de Leon. My soul was drawn into that unterrestrial gleam, and I suddenly wished passionately that it hammered and thundered in my own bosom in place of my paltry heart of tissue and muscle. Doc Blaine ejaculated incoherently. I wheeled. The noise of his coming had been no greater than the whispering of a night wind through the corn. There in the doorway he stood, tall, dark, inscrutable—­an Indian warrior, in the paint, war bonnet, breech-clout and moccasins of an elder age. His dark eyes burned like fires gleaming deep under fathomless black lakes. Silently he extended his hand, and I dropped Jim Garfield's heart into it. Then without a word he turned and stalked into the night. But when Doc Blaine and I rushed out into the yard an instant later, there was no sign of any human being. He had vanished like a phantom of the night, and only something that looked like an owl was flying, dwindling from sight, into the rising moon.